Come check us out, yo. But we’re enough sunshine for you. Classes are about to begin. The telltale signs are around us: the air is a little cooler, traffic has picked up in East Lansing, there are long lines in the store as people scramble for supplies, and if you listen closely you can hear the marching band practicing. There is no doubt about it and there is no avoiding it. Are you excited? Nervous? Eagerly anticipating the parent drop off? That’s all part of the journey. For new students: a new chapter is about to begin. For returning students: the routine is awaiting your arrival. For grad students: the routine, deadlines, and other students anticipate your wisdom. All of this energy creates a buzz on campus that no one can deny. 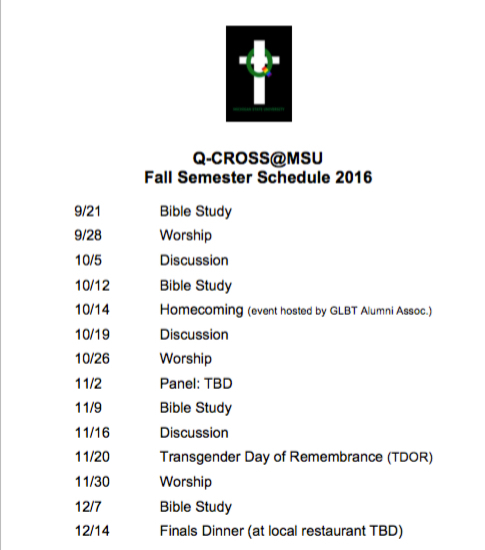 For those of us involved in the campus ministry, Q-Cross@MSU, the school year begins with the welcome events Sparticipation and Spartan Remix. We also have a display at Michigan Pride which is move-in weekend. It’s a whirlwind couple of weeks as we celebrate who we are as a campus ministry/student organization in queer, religious, and student-oriented terms. Our first official gathering as a group is on Wednesday, September 14th at 7:30pm. 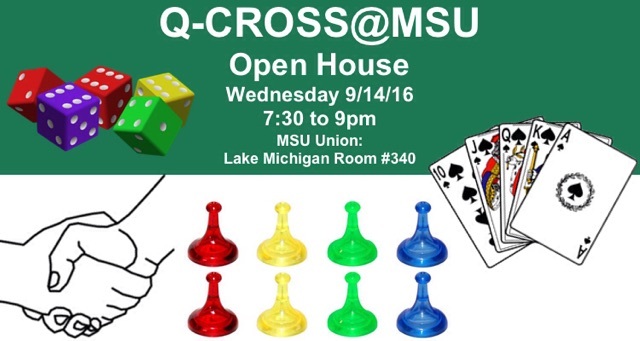 We are hosting an Open House where people can gather, reconnect, hang out and play games. Our weekly meetings will continue from that point through the semester ending with a meal at a local restaurant during finals preparations. Is our group for you? We are a group that meets weekly to support one another, discuss topics relevant to the queer and Christian communities, and we celebrate worship once a month (with an open table for Holy Supper). We laugh, cry, discuss, learn, disagree, and share our lives with each other. It is a space where a person identifying on the LGBTQ+/queer/questioning spectrum and as a Christian/spiritual seeker can have their identity affirmed and valued. We are a space for support in a large community that can be isolating. The routine of classes, papers, and projects can be overwhelming. We offer space where you can be your whole self—whoever that is today or tomorrow.